The RUMLogNG Fldigi Applescript will make your data mode logging easier. This will be the last in a series of articles on RUMLogNG. You can download it for free from this link or see the link below. 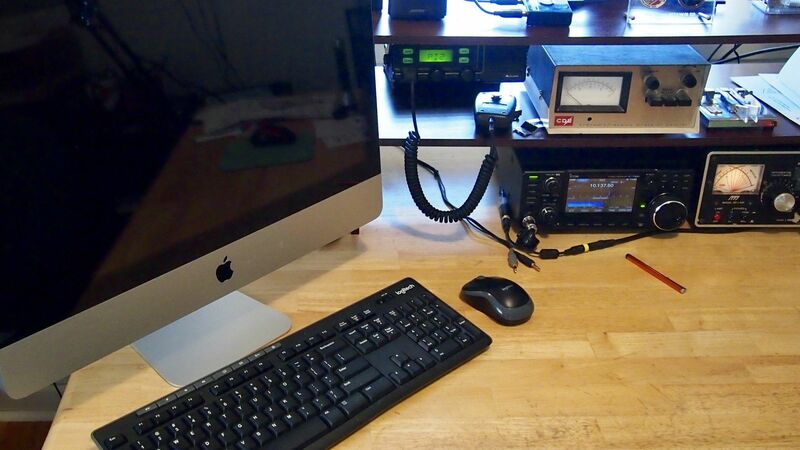 If you need more information on setting it up with the Icom 7300, please look back at my previous posts on the iMac and RUMLogNG. I bought my 3.06 GHz 21.5″ iMac for under $200 and it does the job. I have added more memory to it and I may install a SSD Solid State Drive. The SSD I added to my laptop PC increased it’s speed tremendously. I’m pretty new to the Mac-OS, but it was easy to get the RUMLogNG Fldigi Applescript working. This will be a good starting place for anyone, but is by no means the only way to operate Fldigi with RUMLogNG. You and I may find a better way down the road. The final piece of the puzzle was to get Fldigi logging to RUMLogNG instead of having to manually import the log file into RUMLogNG. Here’s where the Applescript comes in. It does the logging from Fldigi to RUMLogNG automatically. To get it ready I configured RUMLogNG first. There are just a couple of things that need to be done in the preferences for the RUMLogNG Fldigi Applescript to work. See the photos on the next page. Click on the photo to bring up the full image. Nice to hear from you and thanks for commenting. I have not used RUMLogNG with Fldigi in a long time so I’ll bet things have changed. This link is what I used. Name your script the same as mine in both places and try it. I remember it was tricky. You should visit the RUMLogNG forum. I’m sure Tom can help. Thanks for the great Mac videos. They have helped me get everything running except for the logging from fldigi to RUMlogNG. I’ve put the script in the fldigi scripts folder and created the script command for the macro button, but nothing happens when I attempt to log a QSO. There doesn’t seem to be much out there for the new RUMlogNG version 4 and fldigi logging. Wonder if something has changed in this version?